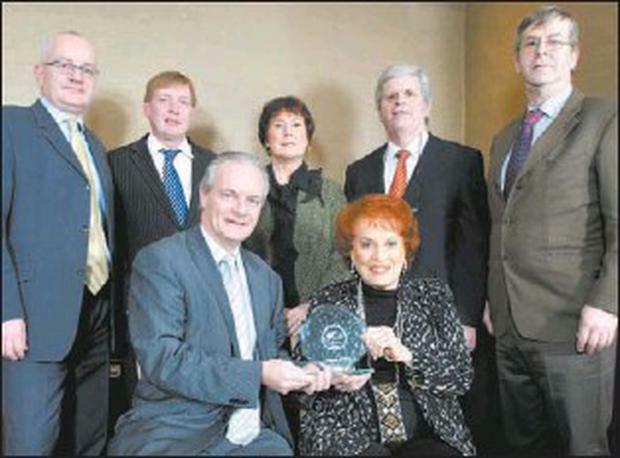 Pictured at the award presentation, front Aidan Forde Irish Examiner with Maureen O'Hara; rear: Frank McCarthy, Pat Lemasney, Carolyn Murphy, Manus O'Callaghan, Donal Deasy. HOLLYWOOD film legend Maureen O'Hara, now in her 91st year, has been named Cork Person of the Month to mark her promotion of Cork and the establishment of the Maureen O'Hara Foundation in Glengariff. The Maureen O'Hara Foundation's sole purpose is to fulfil the dream of this legendary Irish actress, which is "the enhancement of the social and economic well-being of the people of West Cork and the greater Munster region, through the medium of the Maureen O'Hara Legacy Centre". The legacy centre, to be built in Glengariff, will attract tourists, especially from the USA, where the Maureen O'Hara brand is deeply engrained in the essence of the Irish/American relationship. The centre will house the Maureen O'Hara International Film Academy, offer year round courses in all the arts associated with filmmaking and be accredited by universities and film institutions. Ms O'Hara was guest of honour at the Cork Person of the Year lunch on January 21, where she received the January 2011 Cork Person of the Month award. Her name now goes forward, with the other Persons of the Month to be chosen in 2011, for possible selection as Cork Person of the Year in 2011, which will be decided at an awards lunch in January 2012 next. At the 2011 ceremony, Paddy O'Brien, of the Irish Heart Foundation, was awarded the Cork Person of the Year.